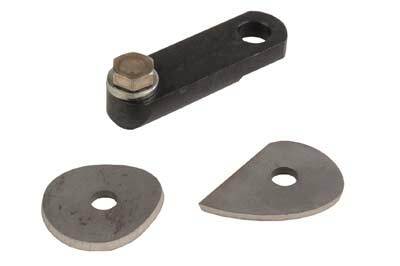 is supplied unhandled with a Power Head Cutter ,which consists of a hook-type cutter onto which is fitted an adjustable shield, two aircraft grade steel links - one straight and one curved - two Allen keys, a spanner and spare Allen screws. 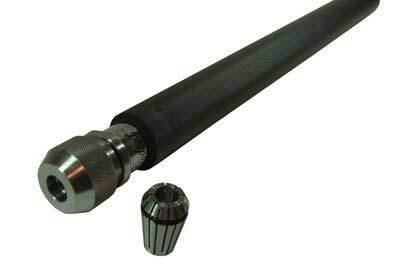 The Pro Scraper Head comprises a straight link along with two medium sized cutters and the Flexi Sanding Head comprises a moulded body with bearings fitted into it. 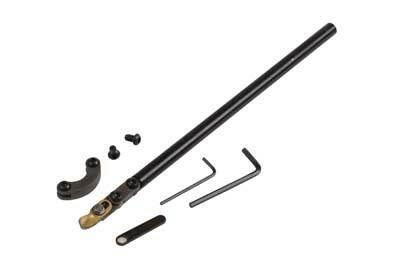 This body fits onto the shaft and the links supplied with the Flexi hollower. Into this body can be fitted a quick - change hook - faced 30mm (1 1/8in) sanding arbor, this fits into the body to turn which transforms it into a free running shear sander. 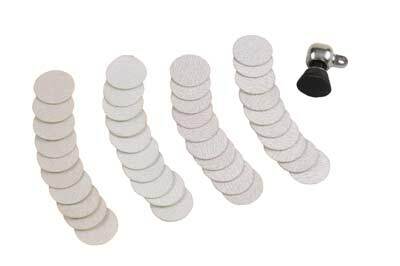 In addition to this, there is also a selection of 35mm (1 3/8in) loop-backed sanding discs which are available in four grits. The first step was setting the cutter adjustment. The cutter is a curved triangular shape and can cut on the left side, right tip and cutter centre. Checking the set up is balanced will ensure there is an even amount of cutter exposed all round. When cutting softwood, the gap can be set slightly wider - to make thicker shavings - than when you are cutting a harder wood. 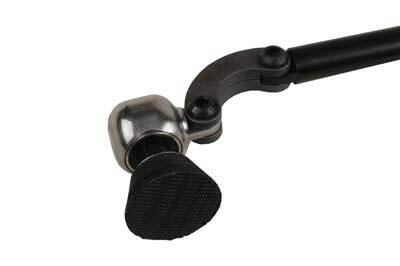 The adjustment is achieved via an eccentric screw adjuster - which is essentially a small Allen key - which increases or reduces the gauge between the brass limiter cap and the cutter along with a hex set screw, or a small steel adjusting spanner. I was pleased and a little surprised at the ease of adjustment; the supplied spanner is a definite asset. 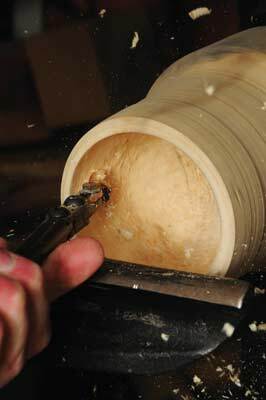 My first use was on a 180mm (7in) diameter silver birch (Betula petula) end grain, open necked vase. The tool was capable of making its own entry cut. The small radius of the cutter tip made entry easy, but worked quicker from a prepared pilot hole. I tried several approaches: a plunge cut down the straight side of the vessel worked well and the savings exited through the open right side without jamming, even though the wood was quite wet. The tool cut well both pushed forward and again on the pull cut. Across the flat bottom of the vase the tool cut to the left of centre in both left and right directions using an arcing cut without any dramas. The second test was on a harder timber, an end grain vessel in African blackwood (Dalbergia melanoxylon). I chose this piece as the heartwood is fairly hard and this particular piece had a lot of the sapwood included. I also wanted to see how the tool dealt with the contrast. 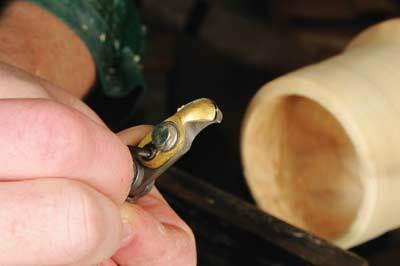 After turning the outside with a gouge, I closed down the cutter adjustment slightly and used the nose of the tool to open up the inside of the vessel. Again, I let the tool cut its own way in without a pilot hole. It performed well and was very controllable on both a push and pull cut. As the timber was harder I took my time and everything went well. The undercutting inside the neck of the vessel went smoothly. The head of the tool was turned so I could continue to cut on the nose and left side of the cutter, and provided the head articulation wasn't overdone, the tendency of the resulting torque to rotate the tool was easily controlled. The third test piece was completely different and was on a hard and well-seasoned side grain blank of cherry (Prunus serotina). 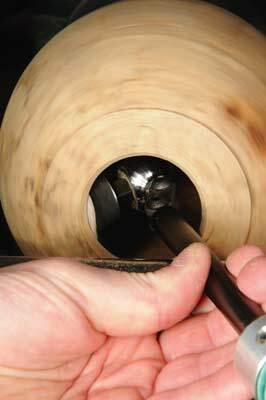 Once again, after turning the outside of the urn, I let the Flexi Hollower make its own cut into the vessel. It cut the hard side grain easily and was a pleasure to use. What was very notable was the ease with which it made its entrance and, unusually, the ease with which I avoided creating a pip in the bottom of the vessel. When I did make one on purpose, the tool was able, without any difficulty, to remove it in a couple of straightforward lifts from underneath the bump. 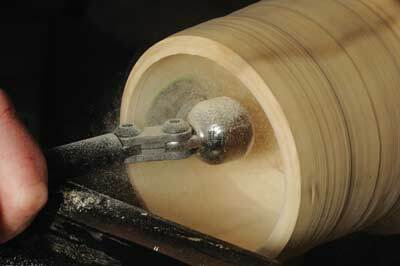 The cuts were made on the centreline with the lathe running around 400rpm. The tool was stable with up to around a 200mm (8in) overhang from the toolrest. I didn't use a small entrance hole - it can work down to 15mm (9/16in) - as I wanted to see the cutter working. The teardrop scraper was subsequently used to smooth the surface finish left by the cutter head, and this also worked well on both a push and a pull movement, but obviously needed a higher speed of around 1400rpm. 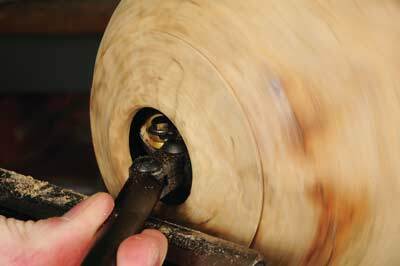 The sander is self/lathe propelled and in use replaces the cutter head on the shaft. The head is articulated and uses the Tim Skilton 'click in' sanding arbors. The 30mm (1 1/8in) size is the standard supplied, but both 50mm (2in) and 75mm (3in) sizes are also available. The head needs light pressure and worked well - best around 8 o' clock and angled upwards - on both the inside and outside of the vase at around 800rpm. The self-powered aspect reduces the required speed and consequently the volume of dust produced. Playing around to find the best angle of presentation soon got the head sanding well, both on the inside and the outside of the work. I also found the ability to articulate the head helps no end. I used the Flexi Hollower with a tool gate, as this allows for a more consistent cutting pressure and makes the tool more controllable overall. unless this is correct, everything that follows is more difficult. All in all, I think it will be a worthwhile investment that will be a firm favourite with many turners. I thoroughly enjoyed using it; the price makes for very good value and after testing it I even went out and bought one! Woodcut have thought about how an item will be used and what other aspects will be needed to finish something off. In this case three tools, capable of being fitted onto one shaft to allow you to shape, refine and finish sand a project. I found the hollowing tool easy to use - yes, you need to experiement with the cutter shield to get the depth cut you require. Once mastered, it is easy to do again. The different links enable you to reach the most awkward of shapes and help you to keep the cutter more or less in line with the shaft - which is vital for good control during the cut. The sharpening of the scraper head hollowing cutter tips is easily done using a diamond slip and the sanding head works a dream. These products are nicely thought out and, in my opinion, they offer very good value for money.